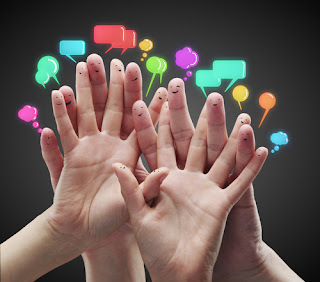 Is more vocational education the answer? A few years ago, Eric Hanushek gave a keynote lecture at a conference at the Amsterdam Centre for Inequality Studies. The talk was entitled "Is more vocational education the answer?" and spoke to debates in the United States about whether or not to strengthen the vocational education and training sector. The U.S. education system is much more “general” in nature than the German and Dutch education systems, which are more vocationally oriented. Is it sensible for the United States to adopt a German-style education system with a strong dual (work- and school-based) sector? Vocational education and training can mean very different things to different people. In some countries, it refers to education and training provided by and in schools, with no or limited exposure to real work situations. In other countries, it designates systems where much of the training is provided in a work place by the employer. The latter is often called “dual system” or apprenticeship. Hanushek's lecture warned against an overly optimistic interpretation of the vocational training sector. While strong vocational education and training systems may do well in integrating school leavers into the workforce (as has been documented before), vocational education is harmful in the later phases of work careers. 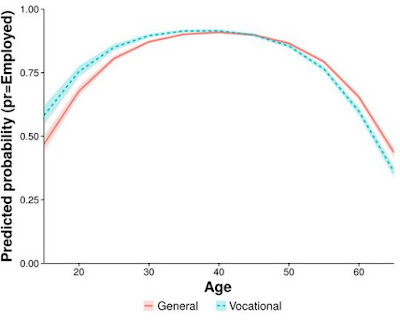 More vocational education is definitely not the answer, according to Hanushek, Schwerdt, Woessmann and Zhang: Vocationally qualified workers are the first to be laid off after the age of 50 because their specific skills are likely to be outdated. should be evident to policy makers when they think about changing the education system. We felt that it was premature to write off the vocational education and training system just yet. From Hanushek et al. 's paper, it wasn't clear whether the problem is a micro-level issue of workers educated in vocational schools relative to those educated in more general programmes, or a macro-level issue concerning the education system. It may be true that people with vocational qualifications are less likely to be employed later in their career, but maybe that pattern is unrelated to the way that vocational education is organised in a country. 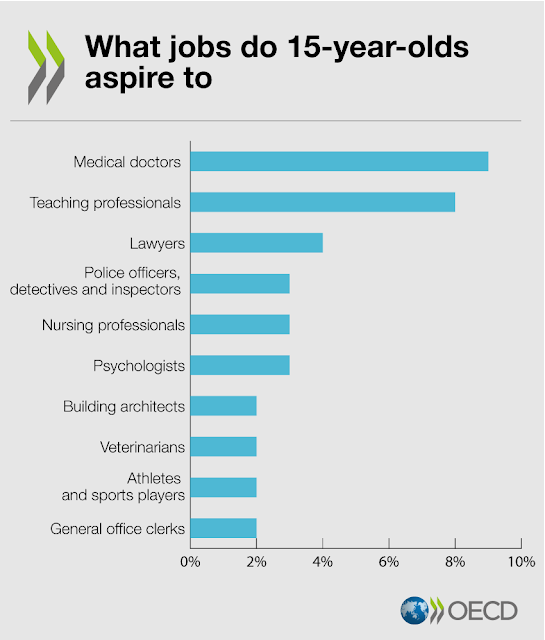 In fact, while the question "is more vocational education the answer?" is a system-level question, it was answered in a micro-level fashion by Hanushek and associates. So we tested whether the lifetime employment profiles of adults with vocational versus general forms of education vary by the size of the dual system, using data on 22 countries from the Survey of Adult Skills (PIAAC). The warning of Hanushek to the proponents of a German-style vocational training system should imply that the late-career disadvantage of vocational degrees would be more pronounced in countries with a large dual system. However, we did not find evidence of that. Two graphs from our paper tell most of the story. The figure below shows the age-employment profiles for people with vocational and general types of education. In line with Hanushek et al. 's micro-level hypothesis, we see higher probabilities of being employed for vocationally qualified workers at the start of their career, but lower probabilities late in their career, among both men and women. This is controlled for level of education, numeracy proficiency and parents’ education. But is this pattern particularly strong in vocationally oriented systems? 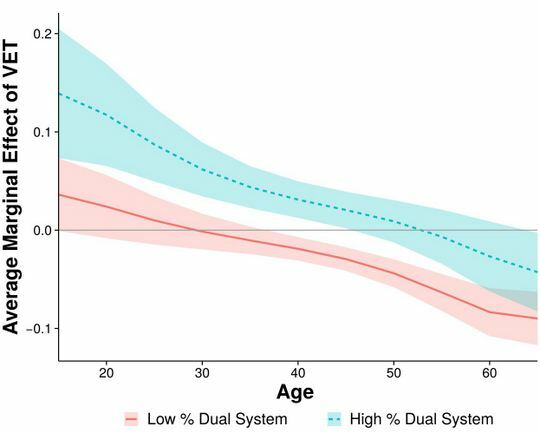 The figure below shows the effect of vocational education across a lifetime (relative to general education, again controlled for education level, numeracy proficiency and parents’ education), in two types of systems: systems with a strong dual sector and with a weak or no dual sector. It is clear that the early-career benefit of being educated in a vocational programme is strongest in countries with a large dual sector (Germany, Austria), while the advantage turns into a (slight) disadvantage later in the career (but mostly in countries with a weak vocational training sector). 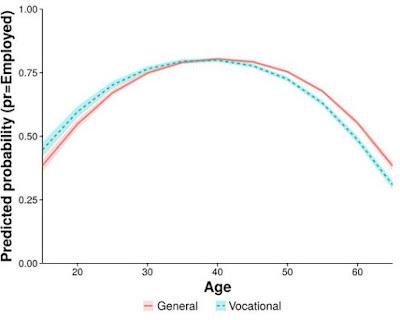 However, we do not see that the blue and red lines cross somewhere mid-career, which would be expected based on the thinking that German-style systems, in particular, result in later-career disadvantage for vocationally trained workers. In fact, strong dual systems are characterised by less disadvantage late in the careers of vocationally qualified workers; and the negative effect at the end of the career is not statistically significant (while it is negative and significant in societies that do not have dual systems, like the United States and Canada). 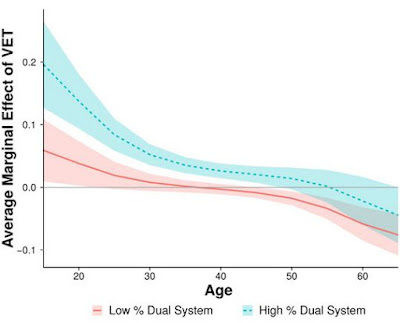 Based on these findings, we conclude that the pattern of late-career disadvantage is not typical for strong vocational systems; quite the contrary. In all countries, people with vocational degrees are more likely to lose their job late in their career, possibly because of a lack of adequate skills. But if anything, strong dual systems offer a safeguard for those with vocational qualifications. Such systems do not adversely affect employment either at the start or at the end of a career. Forster, Andrea G., Thijs Bol, and Herman G. Van de Werfhorst. 2016. “Vocational Education and Employment over the Life Cycle.” Sociological Science 3:473–94. Source figures: PIAAC 2012, release March 2015, calculations Forster, Andrea G., Thijs Bol, and Herman G. Van de Werfhorst. Vocational education and training, depending on its design, can lead to very different outcomes. 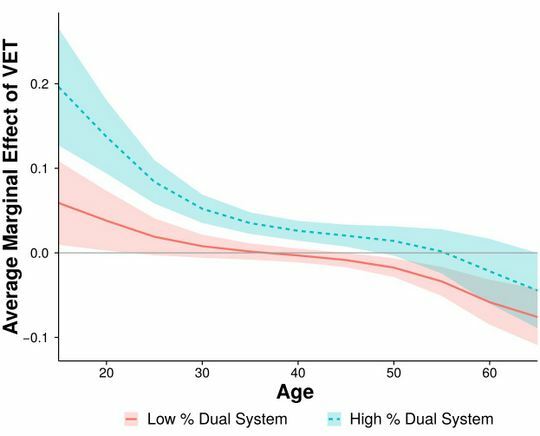 As argued above, systems with strong apprenticeship or dual systems are associated with better employment prospects than those relying heavily on school-based vocational education and training. The OECD forthcoming study, Striking the Right Balance: Costs and Benefits of Apprenticeships, provides further insights into this topic. Drawing on data from the Survey of Adult Skills, it compares outcomes from apprenticeships with outcomes from alternative education and training options. 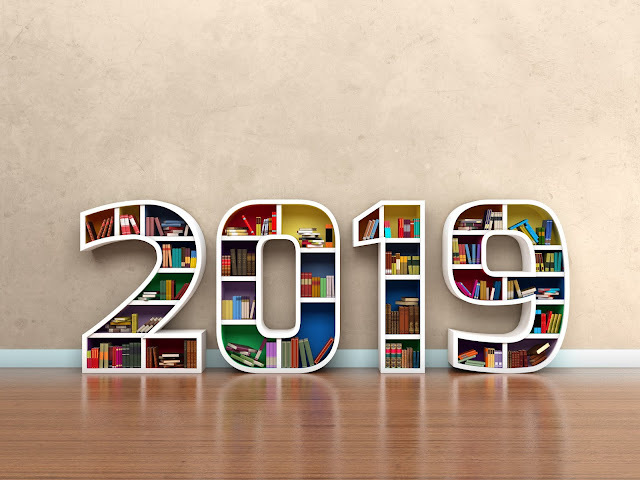 It also discusses different components of the apprenticeship system and conditions under which apprenticeships yield considerable benefits to employers and students.